Parking lot lines striping is a fast, easy way to make your property look great while saving money. All you need to get started is a paint striping machine and some paint! For small jobs AK's Simple Line Striper and line striping paint will get the lot done quickly and accurately. Larger job or a contractor? Choose from our range of top-of-the-line paint stripers that make striping easy, fast and profitable. Browse our Line Striping Store or start by contacting our expert staff: they'll help you choose exactly the right striper for your parking lot, and help you decide which paint you need. We've helped hundreds of parking lot owners just like you get the job done right. With our easy-to-use parking lot stencils and high-quality traffic paint, you can manage your business's traffic effectively. Research before you buy! Take advantage of our experience to help you choose the best paint. Some cheaper paints on the market wear off easily and fade rapidly. AK only supplies long-lasting paint. You get the best value for the lowest price at AK. When parking lot lines are well-marked on your pavement, cars know how to move efficiently in the parking lot, meaning more time in your place of business and less time in traffic jams. Clearly showing traffic direction, where parking is not authorized, and which spots are designated for handicapped parking helps your customers move comfortably and safely through your lot. You can use a 4-inch paint roller and paint by hand over a chalk line you've drawn. Buy a good quality traffic paint to ensure your results will last. For a much neater and less back-breaking technique, you can use a parking lot striper to paint straight parking lines on any asphalt or concrete surface. They're available in a range of sizes depending on how much line striping you're doing. In general, you will need a chalk line, measuring tape, high quality traffic paint, a 4 inch roller (or line striping equipment), tool box, caution tape, and pylons. Depending on the amount of parking lot lines you’ll be doing, you will be able to decide what kind of painting equipment will be most productive for you. It is also important to have the right parking lot stencils to be able to mark special areas for a professional finish. It is easy to learn how to paint parking lot lines, and keep commercial property parking lots looking great. 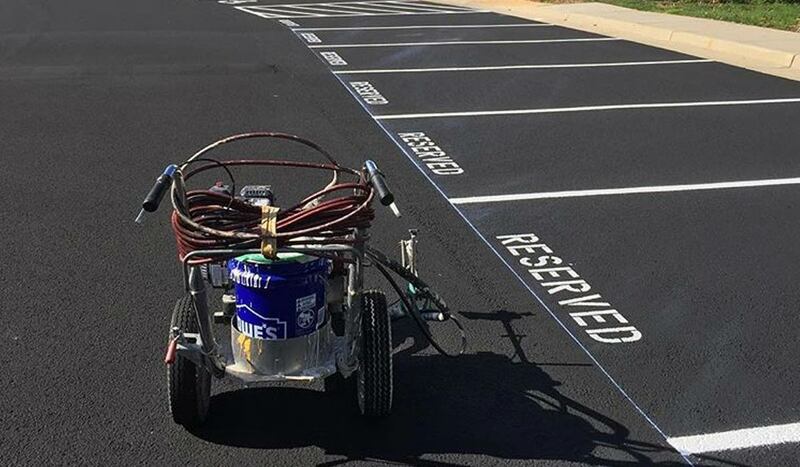 Whether you are a property manager who is looking to save money by doing it yourself, or a sealcoating company looking to expand, parking lot line painting is easy with these simple steps. It's important to know how much paint you'll need before you get to the job site. Call us for help determining your needs. Preparation is key. You should make sure that you have thoroughly cleaned the asphalt surface from all dirt and debris. Most parking lot owners or managers invest into a gas powered blower to clean the asphalt surface. This will save a tremendous amount of time and energy versus sweeping the whole lot by hand. The gas blower can be used for a variety of different things (cleaning up leaves, cleaning asphalt, drying wet areas or puddles, etc.) so consider it an investment for your business. 3. Create a solid base. Once your asphalt surface is clean you should make sure that all your asphalt parking lot cracks have been properly cleaned and that the cracks have been properly filled. You want to make sure that water isn't getting into the cracks as this will cause the asphalt to decay very quickly. 4. Consider sealcoating your parking lot. Once you have filled the asphalt parking lot cracks, you should consider sealcoating your parking lot. Sealcoating your parking lot will protect it from the elements and also give the surface a nice clean slate black finish that will allow for your parking lot lines to stand out in the colorful way that they should. Once you have followed the above asphalt maintenance steps, you're now ready to paint your parking lot lines and add your parking signs. Let us help you make your clients feel like you have invested in your business. The first impression is the most important impression. "We look forward to working with you in the future and please use our company as a reference not only for your great products but also invaluable industry information." Parking lot paint striping can be difficult or easy. The back-breaking, difficult way to do it is by hand, which might be okay if you only have one or two lines to paint. Since we are living in modern times, it makes far more sense to make use of modern equipment. Not only does that make it far easier on you and your body, but you have a far more professional-looking result as well. The modern equipment in this case is called an asphalt striping machine. These machines vary in price and what they are capable of, but all are simple enough for even a novice to learn how to use. Some are designed for use by small businesses or estate-type homes with larger-than-the-average-driveway parking areas. Others are designed for use by professionals and property managers and cost a few thousand dollars. The difference is in what the machine can do for you in quality, quantity, and quickness. Whether large or small, all of the machines work in the same basic way: first they have a method for holding the paint while you are working. In smaller systems, the machine is most often equipped to hold a can or two of aerosol paint. In the larger pro-sumer machines, the mechanism is a bucket with hoses that lead to a sprayer. The machines have wheels to make it easier to steer the unit. The professional units are by far the easiest to steer. Where it is necessary to make sharp turns or gradual curves, the professional machines really shine and give you the best possible result. When your striping requirements include more complex tasks than just straight lines, this can be one of the most important factors in choosing your equipment. Especially when it comes to a front wheel that can be locked in for radius lines as well as straight. Just imagine trying to do a curved line on your parking area or sports field without that option. The units also make it possible to be sure that all the stripes are straight. That’s where locking the front wheel comes in; no danger of you wobbling and weaving your way through your asphalt jungle. This is one of the keys to professional-looking parking lot paint striping. Without using some kind of machine, the lines are not going to be that straight. Just picture yourself trying to find a straight-edge long enough to guide your brush or roller without knocking it askew, or the wind blowing it away. Sure, it can be done, but after doing a few stalls, that straight-edge is going to be covered in paint drips that mar the surface every time you move it. Frankly, you’re much better off to have the right equipment to do the job right, or hiring a professional to do the parking lot paint striping for you. The appearance of the lines has much to do with the color and the types of paints chosen. Yellow is the traditional color for the stripes, but blue is gaining in popularity in some areas, especially for shopping malls. In most cases this is strictly a personal preference or convention, but keep in mind that certain stencils, such as for handicapped stalls, have legal requirements for color, size, and shape. White is another popular choice for stripes. Business owners who choose this color scheme may reserve the use of yellow for painting curves and areas where parking is prohibited. Blue with yellow or white is often required by law to paint the handicap symbol on handicap accessible spaces. Use our AK Paint Calculator to determine the amount of paint you'll need for your line striping job. 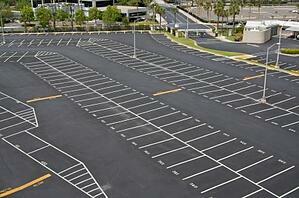 There are two basic types of paints used for parking lot paint striping: water-based and solvent-based. Either way, it must be formulated as traffic paint, specifically designed for parking lot paint striping. Acrylics and latex paints will not adhere to pavement. They will peel away quickly and all your hard work and planning will be washed away. For the very best in visibility, reflective beads are added to the freshly painted lines. Especially useful in areas that have night traffic, snow, or ice, the headlights of cars light up those reflective beads and are far more visible than paint alone. The key thing with the beads is they must be added to the freshly painted parking lot paint striping in order to stick. Once again, applying by hand is no where near as efficient and professional-looking as using modern equipment. Whether it’s a hand-held design specifically engineered for reflective beads, or an add-on to a striping machine, you’ll get the best result. Just remember, not all machines have the option to add-on an automatic bead dispenser, so ask before you buy! There are other ways to make parking lot paint striping unique. Just remember that it also needs to be functional. Talk about putting the fun in functional, check out our fun Asphalt Art page! Everyone is looking for ways to make and save more money, and that is why we think our free parking lot striping course is so important! Whether you are a property manager looking to save a bucket load of money by doing the line striping yourself, or a sealcoating business eager to land new clients and boost your profits, this knowledgeis a fantastic way to line your pockets! Sealcoating And Painting Lines Are A Natural Fit: Think about it. Applying sealer literally blacks out all paint lines, so they need to be repainted. Sealing every 2 years is a crucial part of asphalt maintenance; therefore line striping needs to be done every 2 years as well. A freshly sealed blacktop looks amazing, and freshly painted parking lot striping will make the area stunning-looking. That’s great news for any business whether it’s a mall, office building, school, church, or plaza. It’s An Easy Sell: Putting your best foot forward, and having a professional looking, well-designed parking lot, is an easy sell and easy to do. Property managers who want to save money can easily learn to do this job in-house. Sealcoating businesses will have a whole new world of clients to pitch to when they add parking lot striping to their list of services. Line Striping Machines Get The Job Done Quickly! If you are serious about line painting, there’s a wide range of striping equipment to choose from, and one that will suit your needs perfectly. Never hesitate to contact us at 1-866-399-5562, we’re here to help! Our success depends on your success and we will make sure you get the information you need. Parking lot striping is a fantastic skill to have for do-it-yourself property managers and for sealcoating businesses. Best of all, the line striping course is free, and so is the help of our asphalt experts. Why wait to learn how to save or make money? Asphalt striping is not something that you do once and forget about, especially if you want a safe parking lot. Safe parking lot? Yes - you see, the lines will fade over time due to sun and the elements. Regular maintenance requires repainting the stripes occasionally. How often? That depends on two things: climate and the traffic. Buried under a pile of snow every year? Chances are that snowplows scrape up a lot of line paint along with the ice and snow. Spring repainting is a must. 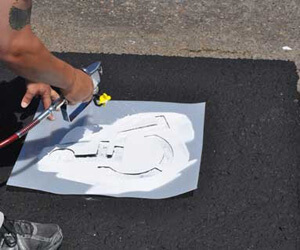 Also, since regular sealcoating is also an important part of maintaining the integrity of your asphalt, you will have to repaint every time the sealant blacks out your line markings. The best-case maintenance is to do this every 2 to 3 years. Did you know? Asphalt lasts between 10 to 30 years, and the difference is how well you maintain it. Click here for the guide that shows you the different steps in proper asphalt maintenance. If you have a parking lot, does it make sense to invest in the asphalt striping equipment necessary to do the maintenance? Although the amount charged by contractors to do the job varies, it is still likely to cost you more for a single repainting than it would cost to buy the basic equipment. Basic line striping equipment consists of an applicator on wheels. There are small units designed specifically for use by small business owners and larger units designed for professionals or for larger businesses.The least expensive stripers consist of an applicator that holds an aerosol can of spray paint. Usually the paint must be purchased from the same company that sells the striper because of proprietary spray tips, but some may have spray tips compatible with other machines. Regardless of which brand aerosol paint can you get, you would still be able to apply the paint by hand for curbs and stencils. The small aerosol line stripers are designed solely for small jobs, e.g. a parking lot with 10 spaces. Two 20-ounce cans of paint might be enough to do 10 spaces. The paint manufacturer will have specifications concerning coverage. The sprayers may be adjusted to spray lines that are 2 inches to 4.5 inches wide. The disadvantage is a big one. This machine is designed for lots of 10 stalls or less. However, it is extremely useful for tennis courts, sports fields, and warehouse markings. 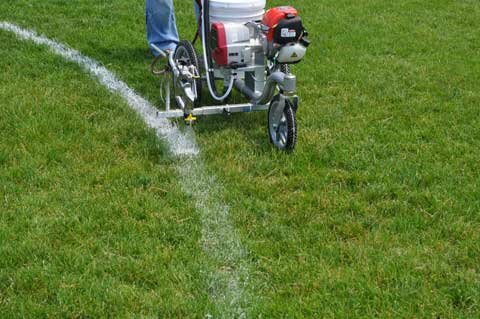 You may well find that in time you will invest in a pro line striper and still use the little guy for touch-ups, playgrounds, fields, and courts. 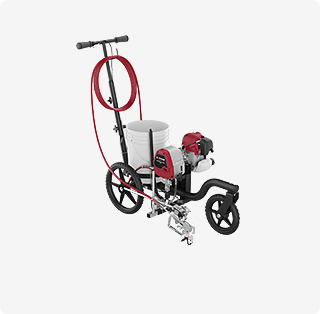 Professional asphalt striping equipment consists of a bucket designed to hold the paint, hoses, wheels and accessories. The better systems are airless, powered by an engine similar to that of a weed eater. Airless sprayers make neater lines and they usually stay brighter longer. They use water-based paints that clean up easier and dry faster. There are many advantages to owning a professional system. If your parking lot has more than 100 spaces, the maintenance can be done faster. That means the lot will be ready to use in a shorter period of time without concern that someone will drive over the freshly painted lines, smearing them and spreading paint to unwanted areas. Financially, the benefits are incredibly good. First, and foremost, you stop paying someone else to do the work every couple of years. Now instead of a recurring large cost, you have an investment in asphalt striping equipment, and need only pay for the paint. No more budgeting and putting off the cost of having a safe and great looking parking lot; just order the paint and get to work. Also, instead of paying a contractor, you can do the job yourself, or give the work to your employees, giving them employment instead of an outsider. A safe, well-laid out parking area also protects everyone who uses it, avoiding costly accidents. There are more important reasons for having your own line striping equipment than just avoiding paying someone else to do the work. You can schedule to do the work at the best time for you, and your property. Whether it is at night, on the weekend, or during a holiday, you know the best time to get the work done. After all, as a property manager you know when closing your parking area is the least disruptive to everyone concerned. If you own one of the better machines, you can rent it out to other small businesses in your area. You can even make line painting a side business. There are how-to guides online for starting your own parking lot line painting business. Don't Want to Buy Equipment? If you don’t have a striper, you will need to hire a contractor. There is simply no way to do more than touch-ups without one. Keeping your asphalt striping fresh and bright will enhance your customer’s shopping experience and is simply the best reflection on your business. There is no easier way to boost your profit line than by adding parking lot striping to your sealcoating business. Being able to offer this service will dramatically expand the number of jobs available to you. Suddenly, you have the capacity to handle parking lots for apartments, malls, schools, businesses, and office space, as well as line striping football fields, tennis courts, and more. When you don't offer this service, you are at a huge disadvantage for bidding on the sealing jobs for these types of locations, as the seal coat will cover up all those existing lines, leaving your client with a situation they need to fix. Expand Your Client List And Expand Your Profits: To grow a business, you have to increase the number of customers you have. Providing a complete service with sealcoating and parking lot striping gives you access to a whole new client base. Think about it: if you are unable to repaint the lines in a parking lot after sealing that means they have to hire a separate contractor to paint. Odds are that outfit also will sealcoat, and will get the job instead of you. Showcase Your Professional Work: The added benefit of parking lot striping jobs is the perfect showcase of what a professional job your outfit does. A key part of getting new clients is being able to show them previous work. A neighbor's driveway is a good example, a commercial client or local business is a fantastic one! From the people passing by who see you working, to the word-of-mouth recommendations, it's a win-win situation when you can add these line striping jobs to your sealcoating business. Easy To Learn And Do: In business, time is money, so learning a new skill like parking lot striping is an investment. Learning how is quick and easy, and our line striping course is free. It covers all you need to know, from a basic intro to the equipment needed, how to prepare the surface to how to price and charge, and more. In a nutshell, everything you need to know about painting lines, from start to finish. In addition, we have an easy calculator to determine exactly how much paint you'll need to get a job done. All in all, this quick course is a minimal investment of your time, and a huge benefit to your sealcoating business. Support Every Step Of The Way: At Asphalt Kingdom, we believe that customer support is our best resource, because our success depends on your success. Our team of line striping experts are available to give you free, experienced and professional advice at 1-866-399-5562, or you can email us. Our business grows only when your business grows, so we're here to help. Expanding your driveway sealing business to include line painting is a natural fit. It gives you the capacity to tap in to a whole new client base of parking lots, schools, businesses, and other commercial properties. Having the bragging rights to showcase your professional work is a boost to your reputation and for word-of-mouth. Easy to learn and do, with expert help just a phone call away, parking lot striping is the perfect way to boost your profits. Parking lot stripers come in all kinds of makes, models, and each with their own bells and whistles. So how can you even begin to choose the right line striping machine from all the various options on the market? With all the advances in striping technology over the years, you can get the perfect piece of equipment for your needs. For instance, in years gone by, you had to buy a conventional machine with an air compressor and a seven-gallon paint pot. Today though there are airless sprayers – lighter, with a suction action instead of a compressor – so no heavy air compressor to push around. The downside? The parts are more expensive than a conventional machine if you are out of warranty. Choose the machine that makes the most sense for your business. The next step is to evaluate how much striping you will be doing, and whether you will need a line striping machine with full stencilling capabilities or not. 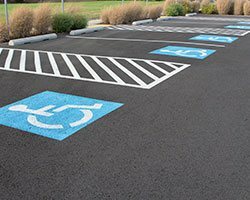 When your job regularly includes the need to mark stencils for arrows, numbers, handicap stalls, and more, make sure to choose a parking lot striper with a detachable spray gun. You’ll save money over constantly buying spray cans of traffic paint! Don’t forget, some come with a 2-gun configuration, doubling your stencilling capabilities and giving you the ability to do double-wide lines in a single pass. Once you’ve decided on stencilling and estimated how much striping you’ll be doing in a year, you’re ready to choose your striper. In the table below, we’ve laid out the key elements of striping equipment, from the average number of stalls per job, number of jobs per year, to stencilling capacity, and also paint holder. There’s more to choosing the right line striping machine for your needs than what the above chart tells you. Buying the right parking lot striper also involves these 3 major factors that must be a part of your decision. Warranty: Always the first thing to look at when buying any machinery, as this gives you the best idea of how well a manufacturer stands behind their product. At Asphalt Kingdom we know how important this is and carry products with the Industry’s Best and Longest Warranty. Parking Lot Striper Parts Availability: Frankly, a warranty is only as good as its parts availability. Waiting weeks, or months, for a replacement part is simply not acceptable. That’s why we carry Titan, with their Quick Response Parts Program. It guarantees the most common repair parts for striping equipment in stock at their over 500 authorized dealers nationwide, or they’ll ship 2nd day by air. Add-Ons To Grow With Your Needs: Depending on the size of jobs you take on, or look to expand to, check and see which line striping machines have add-ons available. Our asphalt experts know that if someone is looking forward to adding a drive-behind seat for the ultimate in striping equipment productivity, they need to choose from the PowrLiner 4955, 6955 or 8955 parking lot stripers. Knowing where you want to expand in future helps narrow down which machine is best for your needs. Choosing a line striping machine for your needs is simple when you start by taking a look at your usage; are you looking to do your own parking lot once-a-year or do you require your striping equipment to handle large-scale projects every day? Most especially take stencilling into account; do you need it at all, one gun, or two? Don’t forget to narrow the field down to the best warranty in the industry, guaranteed parts replacement, and add-on options. Thinking ahead and planning for the future will ensure you get the perfect parking lot striper for the jobs you need to get done. Parking lot stripers are fantastic tools, but are you getting the most from your equipment? 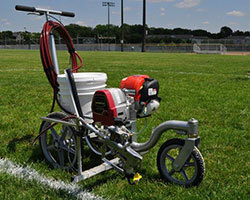 Today we will focus on the best ways to use your line striping machine for circles, arrows, and wall markings. After all, using your striping equipment to the fullest is the key to working smarter, not harder. Circles Made Simple! You know the size circle you need, so how do you get the job done? Let’s say your circle is 10 yards. Find your center point, and hammer in a dowel if it’s a field, or have someone hold it firmly if on asphalt pavement or concrete floor. Take a firmly knotted loop and place it over the stick. Your parking lot striper will now need 5 yards from the center to make a 10 yard circle. Mark 5 yards on the rope (leaving excess rope for the knot), and tie off to your line striping machine, or to your chalk. Either way, make sure to have your front caster wheel set for the turning point of the arc. Test with a dry run before running paint through the striping equipment. Tip: The loop is critical instead of a knot; otherwise the rope will wind around the post and get shorter as you execute your turn! Arrows Done Right: Parking lot stripers with a detachable spray gun are easily the best tools for the job. Rather than wheeling back and forth over your arrow stencil, this style of line striping machine allows you to make passes with the spray gun by hand. You can always buy spray cans of traffic paint if you’re striping equipment does not have a detachable gun. The key thing about arrows is size, and durability. Your best all-around size is a 60-inch arrow. To get durable markings, do 2 thin coats of paint allowing each layer to dry completely. A single thick coating is prone to peeling and flaking, ruining all your hard work! Pro Tip: Having multiple arrow stencils saves time, money, and mistakes since you don’t have to remove the stencil while it dries. Walls And Curbs: If walls and curbs are a big part of your work, seriously consider upgrading your parking lot striper to one with a detachable gun. Not only does this save you and your crew time, it is far cheaper than continually buying spray cans of traffic paint. The main thing here, just like with arrows, is to apply two thin coats of paint with your striping equipment. Not just for long-lasting markings, but also to avoid paint drips running down the wall or curb. Tips: A 217 tip is a good choice for wall markings. Be sure and use extra cardboard around your stencil to protect against overspray from your line striping machine. Striping equipment is an investment that pays off when you use it to its fullest potential. Get the most from your line striping machine by learning how to use it for circles, arrows, and wall and curb markings, and not just for straight lines. It you don’t yet have one with a detachable spray gun, consider investing in an upgrade. Now that’s using parking lot stripers to the max! If you decide to get into line striping, we're here to help! Call us at 1-866-399-5562 if you need help choosing your equipment.